Meteora is a spectacular rock formation in the Thessaly region of north-central Greece. These immense pillars represent a geological phenomenon which is essentially unique in the world. A group of monasteries were built on the pillars, six of which remain standing today. Contributor Rickrayfilms treats us to a spectacular aerial tour of the area, which is considered second in importance only to the Holy Mountain of Athos in its importance to Eastern Orthodoxy. 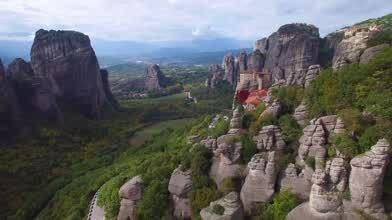 Description: Just before my drone was confiscated by corrupt Macedonian customs agents, I filmed the monasteries and climbers of Meteora, Greece. Spectacular place. I was hoping to make Macedonia look as good, but lost my equipment to them and my drone sold into slavery. The good news is the Macedonian customs did not get away with the footage, I managed to save it!